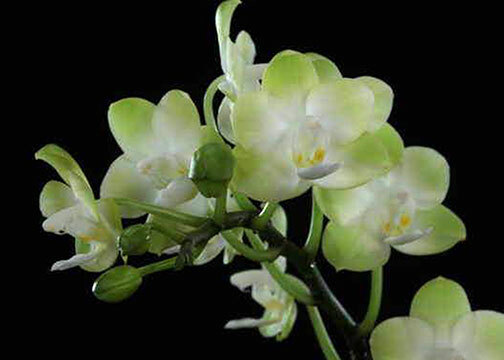 Awarded a well-deserved AM/AOS at the IPA Symposium in 2010, this is one of our most favorite of all green Phalaenopsis ! Producing charming 3.1cm flowers, when awarded it was displayed with 13 flowers on two inflorescences. Its light apple green flowers are beautifully set off against a while heart centrally. And its heavy substance fragrant flowers can be produced in abundance due to its multi-floral miniature pollen parent. One of the very best in this type of breeding and Very Highly Recommended !